It was a week of what could have been for me. I played some lovely golf but wasn’t able to take full advantage of it. Over the four rounds I three putted ten times – I’m not sure I have ever had that many in a tournament. The greens were fast and it was exceptionally windy, so I would say the field had more three putts this week than most. However it is still a big number. I really like Walton Heath, everything about it is great bar the fact that it doesn’t really suit me. I find it very tight and so feel under a lot of pressure to drive the ball well. If it was tree lined I wouldn’t feel as constricted as I can play from the trees but the heather that they have is a very penal. That said I drove the ball well, especially considering I struggled in the pro-am with a hook. I was never really that comfortable but I managed to hit a lot of good tee shots. The course played tough all week as it was exceptionally windy the first three days and then the final round was a wet and miserable day. I was actually surprised by the scoring on Sunday – when I finished up I thought my 2 under was going to move me well up the leaderboard, but when I was signing my card I noticed that I had only jumped 9 places or so. It did improve by the end of the day but overall, considering the conditions we played in, I thought the scoring was impressive. I played my final round with Shane which was good fun, although due to the bad weather we didn’t have quite as much time to chat as normal. Overall I was a decent week. Even though I had a lot of three putts I felt that I still putted well. I hit a lot of good putts from distance but struggled with a few of the short putts. However I holed a lot of short ones too, because with the speed of the greens and the conditions you ended up having a lot of short putts to hole. My driving was good, especially considering that the heather stresses me out, so I’m feeling good about where my game is at and looking forward to the rest of the season. Later this week I’m playing in Valderrama as I am trying to qualify for the final series of events in Europe. After the British Masters I am 86th in the Race to Dubai, which is generally around the number to qualify for Turkey. However, I could do with being a few spots higher to be sure of getting in, so I’ve added Valderrama in the hope of moving up further. A very pleasing final round of two under par 70 sees Padraig skip twenty places up the field and finish in a tie for 22nd place at level par. Nine under par won the tournament! He mixed four birdies with two bogies, and interestingly, considering the tough heathland layout, he made no double bogey for the week! It again confirms that his golf has moved up a notch in the last couple of months since he returned to Europe! Onwards and upwards! Padraig shoots a very nice round of one under par 71 to move up eighteen places and into a tie for 42nd place going into Sunday’s final round. He recorded five birdies, all on the back nine, and four bogies on a tough day for scoring. He tees off in the final round at 9.42am with fellow Irishman, Shane Lowry. Nine under par leads the tournament. Padraig shoots a second round of 73 which included six bogies, four birdies and eight pars, a real roller coaster of a round! He currently lies in tied 61st place and will have to wait until Saturday morning to learn if he will make the cut as play was suspended due to light. Padraig opens his account at this years British Masters with a one over par round of 73. Starting on the back nine, he swapped a birdie with a bogey to be out in level par but after another dropped shot at the first, he came home in eight straight pars. He tees off Friday at 12.45pm on Friday! Padraig continues his play on the European Tour as he tees it up this week at the British Masters. It is being hosted by Justin Rose and this year will be played at Walton Heath. 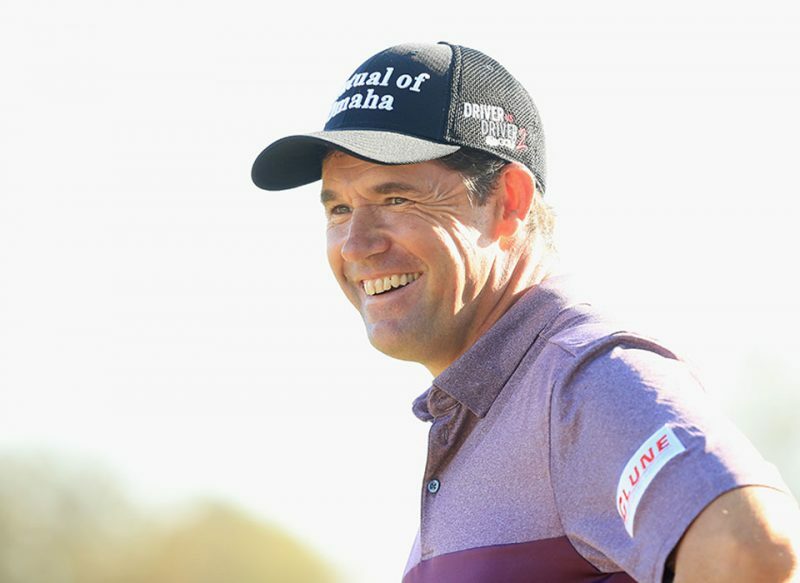 Padraig will be looking to continue his fine run of form, which has seen him finish 3rd, 4th, and 7th in three of his last four tournaments. The course will also be familiar to him as he has played U.S Open qualifying here for the last two years and has shot some very good scores around the heathland layout! He tees off in the opening round at 8.30am with the winning Ryder Cup backroom team, Captain Thomas Bjorn and fellow Vice Captain, Lee Westwood. I’m in Surrey this week for the British Masters. It’s being hosted by Justin Rose and he has chosen to hold it at Walton Heath GC this year. I’ve played here the last four years or so for the US Open qualifier. They have two great courses and this week we are playing a composite of the two. They are using 16 holes from the Old Course and 2 from the New Course. I’ve played the courses here a number of times but I have to say that I have never seen it play as tough as it is this week. Three holes that are normally par 5’s have been reduced to par 4’s (13th, 14th & 16th) and by moving the tees up on these holes it has brought the trouble more into play. The course is playing hard and fast and the fairways are lined with heather. I have to say it is a very different course to the one we play at the US Open qualifier. This week will be very much about keeping the ball out of the heather. You will see players laying up a lot from the tee and leaving themselves with long approach shots rather than taking the risk of hitting a driver into the heather. The fairways are very firm but they have kept the greens receptive so it is possible to play the course with a conservative strategy from the tee. I mixed it up today, there were a few holes where I laid up, then a few where I took it on. I think to score here you have to take a bit of risk from the tee. I played a couple of holes on Tuesday and then the Wednesday pro-am, when I was decidedly ropey. I struggled a bit from the tee and that makes this course tough. I did a bit of practice after the pro-am and by the end of it I was a lot better. I’m looking forward to getting out and playing. While the course is tough, it is scoreable if you put it in play. The greens are in great condition with some serious pace to them. While I didn’t play great in the pro-am I know that it doesn’t dictate how I play in the first round. I?ve seen myself play good and bad on a Wednesday and then play totally different on a Thursday. I’m out at 8.30am on Thursday with Thomas Bjorn and Lee Westwood. All the old guys together! !